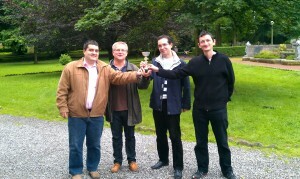 Europchess Wins Division 3 of FEFB Intercercles! Europchess took 3.5 points out of 4 in the FEFB Intercercles Division 3 on 24 June rounding up a solid performance that saw the team finish 2.5 points ahead of their closest rivals. Apart from a nice trophy, the reward for the efforts of Vladymyr Dedobbeleer (who scored 3.5/4), Luis Carlos Busquets Perez (2.5/4), Georgi Tomov (3/3) and others is promotion to Division 2 for the next year’s event. The rainy Sunday afternoon got off to a flying start with a win in just 8 moves for Jozsef Molnar (White) over Francis Knudde (1750). Black gave in to the temptation of bringing out his Queen early in an attempt to harass White’s development and was swiftly punished as Her Majesty got trapped on move 6. Luis Carlos with Black faced Roger Verbeque (1574). A typical closed game exchange of pieces led to an unclear position in which White offered a draw. 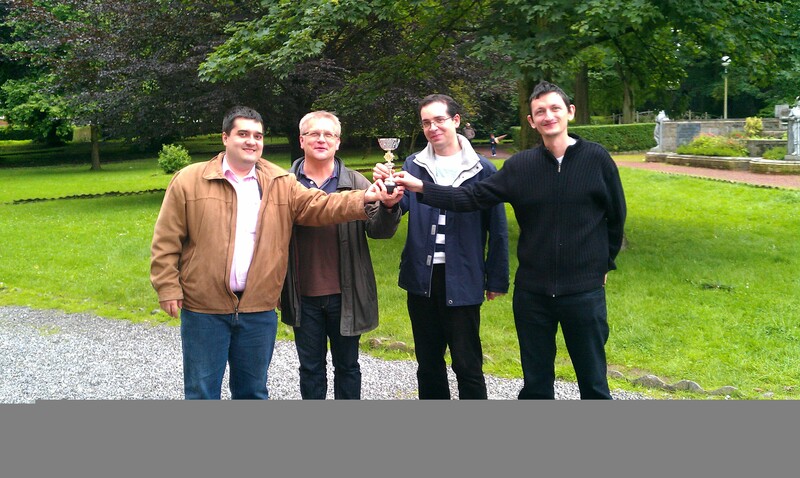 Considering the good lead that Europchess had in the standings and Jozsef’s win, Luis agreed to share the point. Vladymyr, playing White against Heribert Poth (1443), missed a small trick in the early middlegame that allowed his opponent to win a pawn. However, he recovered well, organising strong pressure against Black’s hanging pawns in the centre. Black chose not to keep his material advantage but play aggressively and launched a speculative attack on White’s King that backfired. From then on, White was always in control and despite some inaccuracies forced resignation after just over three hours of play. Georgi, playing Black, managed to overcome Stephane Thibaut (1770) only after a tough battle and an exchange of errors. In a complex opening position, White went for a misguided exchange of Queens that led to a clear structural advantage for Black. Still, it was hard to make progress and White hung on using every chance to swap his inactive pieces. In time trouble, Black’s advantage grew and he sacrificed a piece at a time when a prosaic win was also available. However, the follow-up to the sacrifice was not precise as Black rushed to get his piece back instead of making better use of his passed pawns. A rook endgame ensued where White had every chance to draw but let the game slip away again.